When my little Emma was turning 4, everything in her world revolved around the newest Disney hit, Tangled! So, naturally, we got a little “tangled” up in party planning! We had a blast setting up the market place scene with flowers for the girls hair, a golden flower hunt in the bushes, and even an Ugly Duckling Tavern complete with Ruffians & Thugs (thanks to her teenage brothers.). 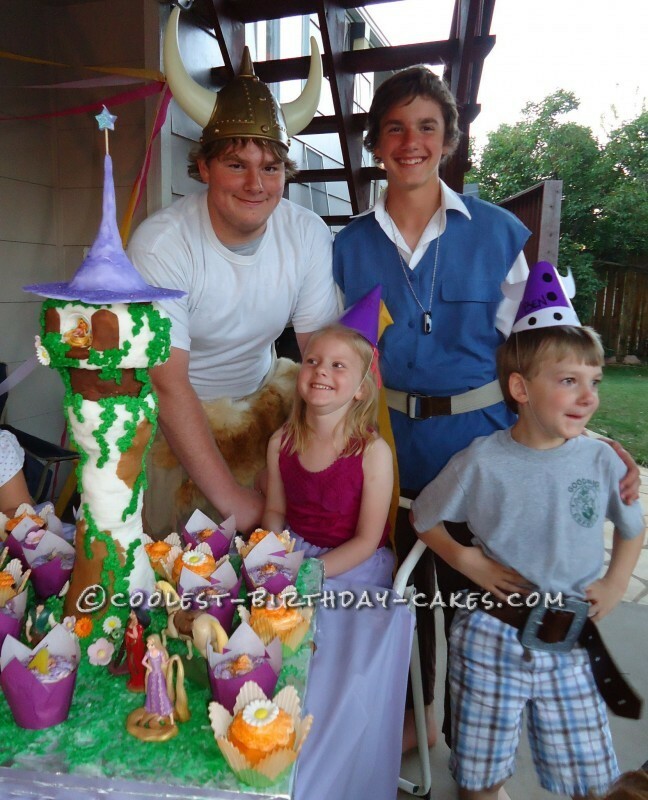 Lots of fun and imagination went into planning the party, but the absolute crescendo was the moment I brought out her cake–which, quite literally, towered over the guests! We started with a wooden platform with a 2″ dowel rod screwed into it. 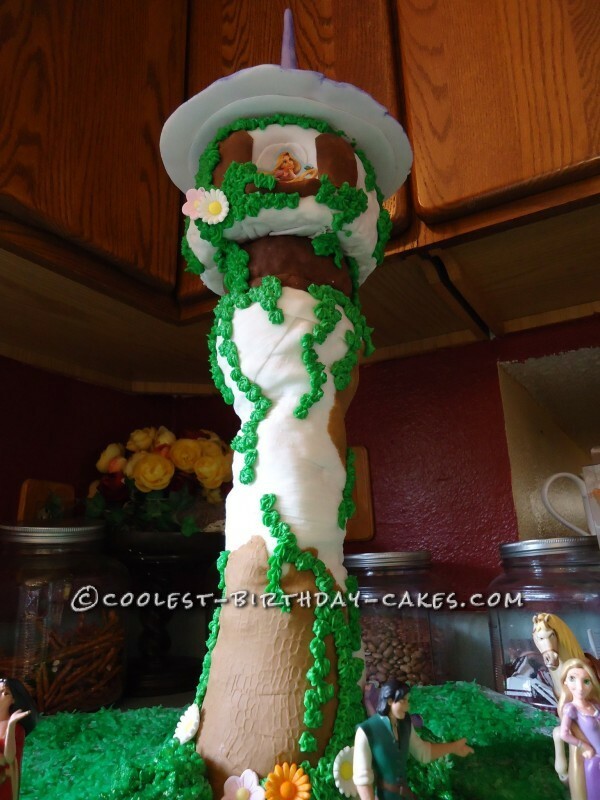 Next, I covered the dowel from bottom to top with rice-krispy treats, mashing them to the pole. Then I rolled out pre-made fondant and covered the rice-krispy treat tower. I used some little rock-impressed sidewalks from my Christmas village to mash some stone/brick into the fondant. When it was time for the top of the tower, I had baked a small 4″ round angel-food cake and I covered it with the white fondant. For the roof of the tower, I mixed in some lavender coloring with the fondant and sculpted it. I let this dry overnight and set it on top the next morning so it would be nice and hard. The morning of the party I spread a little frosting on the platform board and sprinkled coconut all around for grass, then used green icing spray (from Walmart) and sprayed the “grass” green. 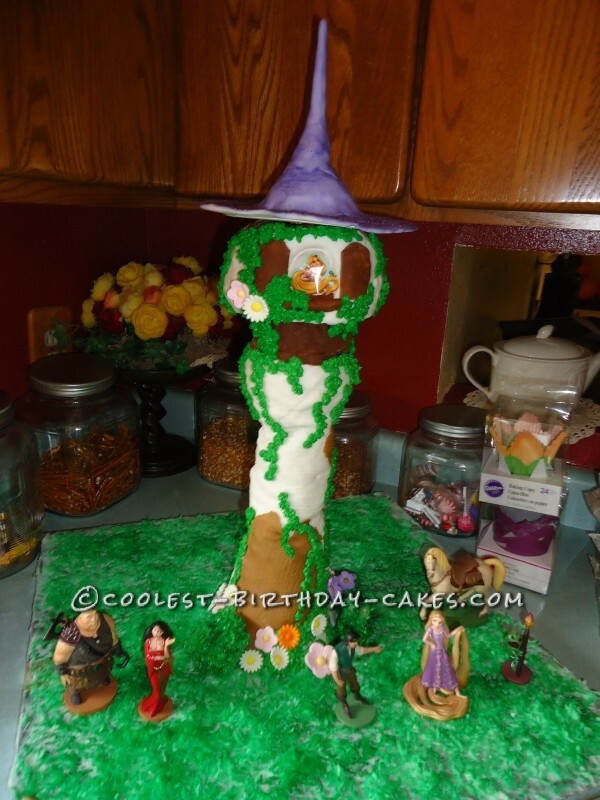 Next, I piped on some vines and carefully placed some pre-made candy flowers around, and then placed cupcakes all around the base (along with mini-character figurines from the movie.) Everyone was amazed, but no one more than Emma Jane! She squealed with joy! We ate up the cupcakes, but kept the tower around for a while just to admire it! All in all, I spent about 3 1/2 hours on the tower cake. Once all of the pieces were baked, rolled, and mixed, the assembly went really quick! Then about another hour was spent on the cupcakes! Trust me, if I can do this….YOU can do this!!! Birthday cake idea Posted by Shala F.